The Surprising Drains On Your Company's Finances You Might Be Missing | TimeMachines Inc. Efficiency is incredibly important to keeping any business up and running; when operations aren’t moving as quickly and smoothly as possible, it can cost your business countless dollars in lost time and fixing mistakes that shouldn’t have happened in the first place. Is your company losing money and time in unexpected places? Here are the top aspects of your business you should check to find out. The hiring process is incredibly complicated, and lots of elements factor into an employee’s decision to stay or leave your company. However, if you notice that your company has a higher turnover rate with new employees, it might be worth looking into. Hiring and training new employees is an expensive process, so it’s important to make sure that investment is going to be worthwhile in the form of a long-term employee. If you’re looking to draw more customers to your business, you’ll want to make sure that you’re using the most effective and efficient marketing methods possible. Spending valuable capital on outdated marketing methods not only keeps your marketing from drawing in the most customers possible, but it means that you’re likely spending money on an inefficient process. Make sure you check your current advertising campaigns to ensure they’re using the most efficient methods and mediums available to reach your audience for a reasonable cost to your business. You might not be paying too much attention to your punch clock unless you work in a few very specific industries, but you might want to take a closer look. Are all your clocks synchronized correctly? If not, you’re likely losing money. 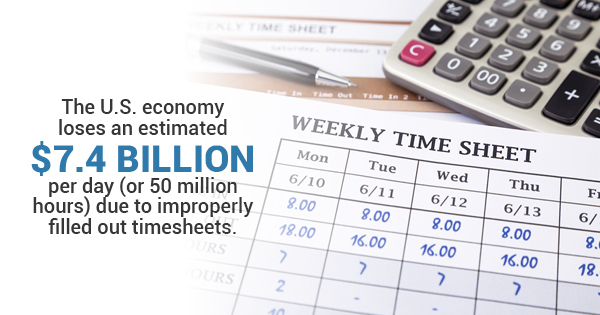 The U.S. economy loses an estimated $7.4 billion per day (or 50 million hours) due to improperly filled out timesheets. By using GPS network time servers, you’ll be able to accurately synchronize your company’s network clocks and avoid losses due to improper timekeeping. Looking for equipment to help your company fix its timekeeping efficiency issues? Time Machines carries a wide variety of GPS network time servers, network clocks, POE clocks, and more to help your company improve its operations and overall efficiency, saving your company both time and money.